International Rescue Committee (IRC), delivering care to victims of sexual violence in more than 17 countries, helping survivors gain economic independence, and working to strengthen national and international laws against the exploitation of women. Jan Ahders, the director of the production, and the actors she has recruited have all donated their time as part of their commitment to the two organizations, thus ensuring that the production costs are as low as possible. The play will be presented in Davis on October 18 at 3 p.m. at the City of Davis Veterans Memorial Theatre. Friends of Empower Yolo is accepting donations from local businesses and groups. Between donations from local groups and individuals and ticket sales, the Friends of Empower Yolo group hopes to raise at least $10,000, with half of the proceeds going to each of the two organizations. If you, your group, or your business would like to make a donation please contact Georgene Redmann <georgene.redmann@gmail.com> or Susan Gefter <stargefter@aol.com>. To follow the development of bringing the play to Davis or to volunteer to help with the production, please follow the event on Facebook: SEVEN the play in Davis. 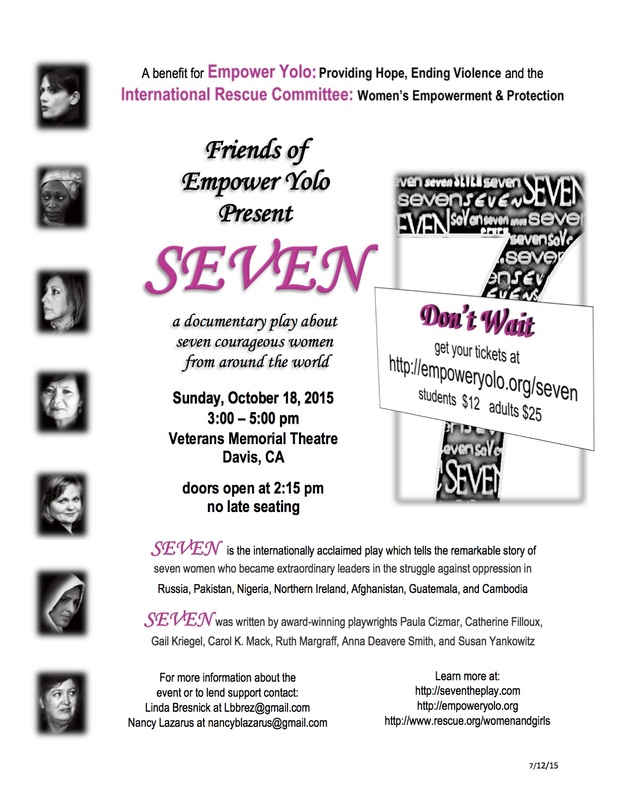 Tickets go on sale August 1st on the Empower Yolo website at http://empoweryolo.org/seven –and it’s anticipated that tickets will sell out quickly.